Chevrolet wants people to “love” not “like” its redesigned 2016 Malibu on Facebook. The General Motors Co. brand on Wednesday released a new social media video ad called “From Like to Love” that incorporates Facebook’s new “Reaction” buttons, a feature that’s an extension of the “like” button that allows users to pick from six different emotions. 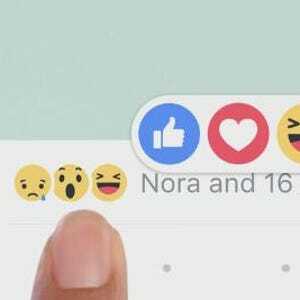 Each emotion icon is named for the reaction it’s meant to convey: “Like” remains a thumb’s up button; “love” is a heart; and “haha” “wow,” “sad” and “angry” are all smiley face emojis that convey the different reactions. Chevy says the 60-second ad is one of the first online videos to incorporate the new feature, which launched on Wednesday. The Chevrolet video includes a video and photo collage of different moments in life — from a mother holding her newborn for the first time and a grandmother blowing the candles out on her birthday cake, to a child’s first day of school and taking ownership of a new car. The ad is narrated by actor John Cusack, Chevy’s voiceover pitchman. Throughout the ad, he talks about society becoming a “nation of likers” as people “like” different things on Facebook to eventually ending with “we like though we wish we could do more” before going into a pitch for the car. Craig Daitch, a Chevrolet spokesman, declined to comment on if the brand plans to expand the campaign to other vehicles. The new online video continues with the upbeat attitude of Chevy’s “Find New Roads” ad campaign, which replaced the well-established “Chevy Runs Deep” in 2013. The 2016 Malibu is on sale now starting at $22,500 including destination. It features a more sleek exterior, better fuel economy and roomier back seat than the previous model. The car sheds nearly 300 pounds and has a new architecture. It also adds a hybrid model that Chevy says will get better than 45 miles per gallon combined city/highway.